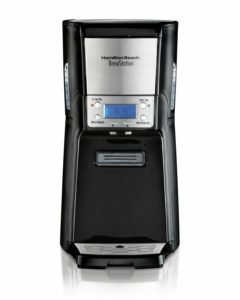 Hamilton Beach released many models of coffee makers, and they gave their best in order to create high-quality, versatile, easy to use coffee machines. But sometimes it is hard to see clearly their differences in features. 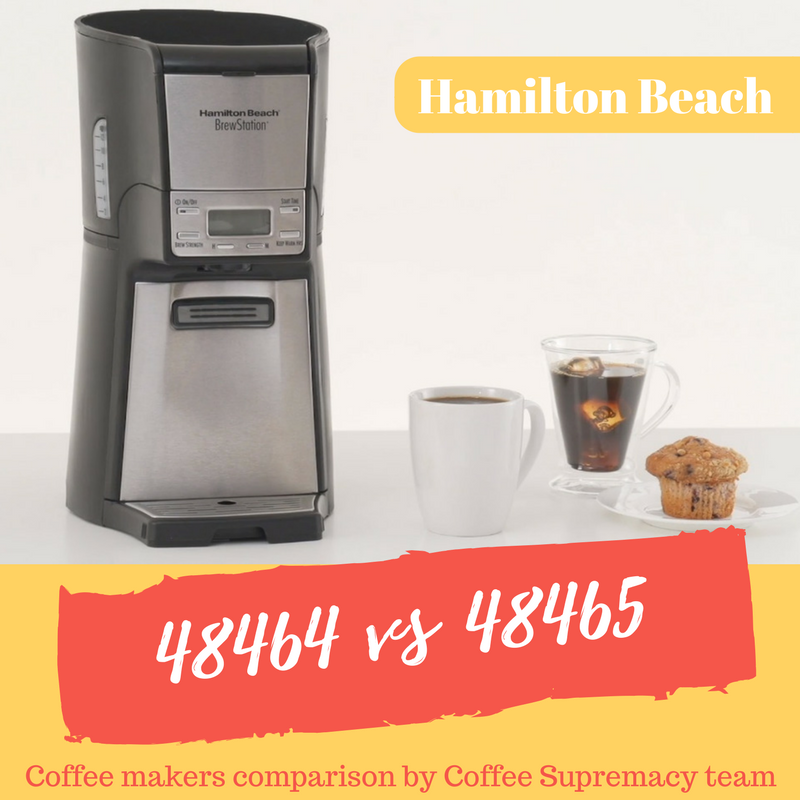 At the moment, when looking at Hamilton Beach 48464 and 48465 coffee makers, the only difference we can see is price, but everything else seems the same. That is why we are here. Hamilton Beach 48464 and Hamilton Beach 48465 do have small differences, they are not that significant and they are basically connected with its design, but we also have to say that the price difference is really negligible, so you won’t lose much, no matter what model you decide to buy. We will compare these two coffee makers in detail feature by feature. In this table, it is easy to see that the differences are connected to its appearance, but we will explain their features and what exactly they can do. Appearance: both coffee makers are made of a combination of plastic and stainless steel. The difference is that the 48464 has the control panel made of stainless steel, and 48465 has the control panel and the wall behind the cup made of stainless steel. This is the reason why 48465 is a little heavier than 48464 model. The Hamilton Beach 48465 is also a little bigger than 48464 model, but the difference is so small that it is not worthy of mentioning. Water Reservoir: the reservoir of both coffee makers models are made for 12 cup capacity. The water reservoir can be easily removed and refilled. The reservoir has a water level window for easy tracking when it is time for refiling. Brew Station: The reason why this machine is called BrewStation is that these models have an inner coffee reservoir that keeps coffee warm. 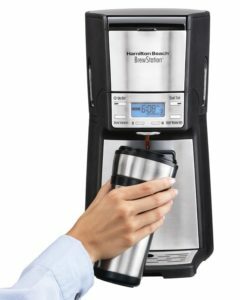 By pressing a dispensing bar you can pour coffee directly into your cup or travel mug. There is no need for a carafe or hot plate because this inner coffee reservoir keeps coffee warm up to 4 hours, and you can get only one cup whenever you want. With this system, there is no mess made by coffee dripping. Timer: both models have brew delay option which allows you to set the precise time when you want your coffee ready 24 hours in advance. Auto Shut-off: this option can be set up to 4 hours maximum. It also keeps coffee warm until the machine turns-off. Both models have this options. Brew Options: 48464 and 48465 models have four brew options, bold, regular, iced coffee and small batch. Coffee: these coffee makers use ground coffee and the basket-shaped paper filters. Cleaning: cleaning is easy since all the parts are removable, but they are not dishwasher safe, so you will have to clean them manually with warm water and soap. Which coffee maker is better? Hamilton Beach 48465 – 4,7/5* also bulky but its design is modern since it has some extra parts made of stainless steel. Also great coffee machine that make very hot and tasty coffee. Check other reviews, price and buy Hamilton Beach 48465 12 cup coffee maker on Amazon. It is not easy to say which one is better when we speak about these two models of Hamilton Beach coffee makers. They are same when it comes to important features, and the only difference is that extra part made of stainless steel that is attached to a Hamilton Beach 48465 model. The price difference is so small that it is not even worthy of mentioning. You should decide on your kitchen design because the appearance is the only thing that makes these two great coffee machines different from each other. You can’t make a mistake whatever choice you made.